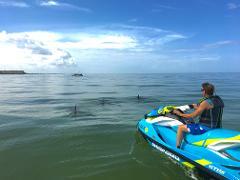 Join us for a 2 hour Dolphin Jet Ski Adventure. Be the captain of your own Sea-Doo Jet Ski. Explore 25+ miles of Southwest Florida waterways, mangrove trails, and the Gulf of Mexico. Call 239-405-7155 for times and availability.